We are sad to learn of Don Gramling’s recent passing and our hearts ache for his family’s sudden loss, and ours. 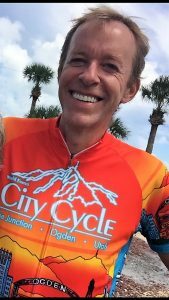 Don became a randonneur in 2013 and quickly accumulated a pile of awards, medals, and significant accomplishments including a K-Hound and completion of PBP ’15 and other 1200Ks. Don’s completion of Paris-Brest-Paris was legendary and involved being up against the time cut-off, failed neck muscles, a broken crank arm, and a Frenchman whose grace and empathy rivaled Don’s. In my 15 years of randonneuring and four PBPs, I have never seen someone more deserving of the honor of ancien as Don. But the thing that set Don apart as a special person, friend, and riding companion was his good and gracious nature, positive attitude, and infectious smile. No matter how lousy the weather, long the miles, or weary the riders, Don was always present to appreciate the moment and make it a good time and great adventure. Don was ever-present to enjoy post-ride food, beverages, and tales of past exploits and future shenanigans. Don volunteered for all four days of the 2016 Cracker Swamp 1200K and greeted everyone — riders and other volunteers alike — with “What can I do to help?” Don’s selflessness and helpfulness were inexhaustible. Don will be greatly missed. Chapeau, good friend, as you ride on to the next adventure. Thanks so much, Paul, for such a fitting tribute. As you know, we all toed the line at PBP ’15 not knowing what to expect. His finish was legendary, epic and in true Don fashion–so funny—that I am sure his “unique” story rivals any finish in the long history of PBP. A smile that lit up the room! Thx Paul. My heart is broken. Thousands of the best miles with Don. Nothing was impossible and every mile was an adventure. Don always greeted everyone with a smile, he will be missed. He was a great person who would help in anyway he could. The first time I met Don was on a Six Gap training ride in May 2013. Indeed he was a joy to be around, with that infectious smile of his. He quickly let me know that his nickname was “Sir Fallsalot” and sure enough, before the end of the weekend he did fall off his bike on a hill – no thanks to a dog that came out of nowhere. We joked about that for a long time. Like everyone else who had the privilege of spending time with him I am saddened to hear that he is no longer with us. Thinking of his family and close friends as they cope in the days, weeks and months ahead. Don was a pleasure to ride with, he was always quick to help you when needed. He will be missed by all who knew him. Horrible news. Got to know Don during the last 4 years riding in CFR events. Rode home with him and Jeff Stephens from the Mascotte control the final 30 miles of the 400K back in March, my last brevet, when our bodies were begging us to stop the madness, and shared with him at the Inn on the Green those precious moments when you’ve finished and you’re soaking in, with your comrades, the recognition of a challenging ride well-ridden. Hard to believe someone so full of life such a short time ago is suddenly gone.